Summer is almost over and the school year is quickly approaching! A lot has been going on this summer with some new changes to the dining facilities here on campus. Here are the top 10 changes for dining this fall. We removed all nuts from our facilities and no longer use nuts in production of food. Pre-packaged nut items will still be sold in the market locations. To help you better navigate dining styles on-campus, all buffets have been rebranded as “Commons.” The locations are: Bell Tower Commons, Western Commons, Garden Commons, Martin Commons, and Maplestreet Commons. Your Miami Chefs have developed several vegan options that are cryovaced (vacuumed-sealed) and frozen in individual portions. You can choose from four options including spicy roasted cauliflower, artichoke and potato casserole, three sisters vegetable stew, and a quinoa bowl with mixed vegetables. To enjoy one of these vegan meals, visit the Comfort Thyme station at Garden Commons. New to our team is Ashley Blust, a full-time registered dietician. She is part of several projects to that will make nutrition more accessible. This includes showing allergens, diet preference identifiers, and nutritional information on menus at both a la carte and commons locations. Maplestreet Commons, an all-new buffet location, will feature pizza, a deli, paninis, custom stir fry, pasta, burgers and allergen-friendly options. Encounter will be relaunched as Maple Grill with an expanded menu including quesadillas and quinoa bowls, formerly from Americas. The Q will be introducing dessert items that can be served traditional or smoked. Looking for something on the lighter side? The Q now offers a made-to-order salad station. Western Express, formerly Tea Hive, will be your go-to spot for grab-n-go sandwiches, salads, and sushi. Start your day off right with breakfast sandwiches and fresh pastries. Look forward to more options at Bell Tower Market. Stir fry to-go and a full Traders’ Greens salad bar will provide more convenient and nutritious items for a quick meal. Bell Tower Market will continue to offer hot breakfast sandwiches, pizza, customized deli sandwiches, coffee, and smoothies! Three new locations will debut this fall at Armstrong Student Center. Cafe Lux—Envision the perfect cup of coffee in a European-inspired venue. Accompany your drink with a rotating selection of pastries, soups and sandwiches. The Toasted Bagel (formerly Traditions) offering a variety of breakfast sandwiches. Red Zone—Enter by way of repurposed flooring from the Withrow basketball courts and immerse yourself in Miami sports history while dining on arena favorites. Have-to-try items: Avocado & Turkey Club, Schnecken (Cafe Lux); (The Toasted Bagel); Grilled Mac & Cheese Sandwiches (Red Zone). Miami Ice will be your go-to place for gelato, ice cream, shakes, smoothies! Established in Columbus, Ohio in 1991, Crimson Cup Coffee and Tea Roasters was recently ranked as one of the Top 25 Best Coffee Roasters in America and is served at Café Lux in the Armstrong Student Center. Miami is proud to be partnering with a passionate company who’s mission is founded on the ideas of L.Y.F.E. (Leave you Feeling Energized) and L.O.V.E. (Leave Others Very Energized) — two mottos we can get behind. A student taste test helped select a custom blend from Rooted Grounds Coffee Co. (owned and operated by Miami alumni). Now you can enjoy a cup of Miami Grind at Garden Commons, Red Zone, Miami Concessions locations (excluding Goggin), and through Miami Catering. The Places to Eat section has been revamped to give more information about each location. This includes a staff listing with contact information, daily menus for commons locations, and a la carte menus in both English and Chinese. In each dining operation, you will find a QR code and link to connect you directly to these menu pages on our website. The feedback we have gotten from our second year student so far has been very frustrating. So many fewer options of places to eat. Nothing very close to Richards. Tremendously long lines. Only hash browns left for breakfast. Miami bragged about the dining services to prospective students. It was not a good experience on our part last year and so far this year has been even worse. I’m hoping that it’s the learning curve if a new year but doesn’t the university do this every year. Hi Rhonda! We’re sorry to hear of your student’s frustrations. The overall number of venues to eat on campus currently sits at 30+. 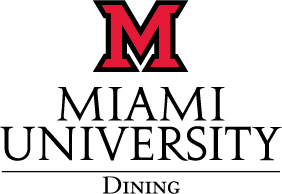 Check out this link for a map and description of each: http://miamioh.edu/hdrbs/dining/places-to-eat/index.html From Richard Hall, a 10 min walk will get your student to 15+ of these locations. The closest being MacCracken Market, Delish, The Q, Maple Grill, Starbucks, Maplestreet Commons and the Rec Center Pro Shop. If you have more questions, we’re happy to follow up. Thank you!